Many accidents like falls, burns, and poisoning occur in the home. Which is why there should be no delay in properly inspecting each and every room to eliminate any problematic areas, and conducting a home safety audit. Many doctors recommend this practice be done once a year. Home should be a place where we are all safe. Move electrical cords from traffic areas anywhere in the home. Tape them to the wall or baseboard if helpful. Remove scatter rugs, especially those without slip proof backs and particularly those at the bottom or top of the stairs. Seniors develop balance issues as they age, and sometimes peripheral vision deteriorates. They won’t see the rug. Install railings outside for easy entrance and exit. Make sure railings up the stairs are secure. Be sure there is proper lighting throughout the house, especially if there is a staircase. There should be a switch at the top and bottom of the stairs. Don’t ignore this one! Be sure the fire extinguisher is in good working order and easily accessible. If your senior needs a cane or a walker, make sure they USE IT, instead of holding onto chairs and walls, etc. Remove clutter or anything that might interfere with the entrance and exit to the home. Install a smoke detector and replace batteries twice a year, and add a carbon monoxide detector. Move and rearrange furniture in living areas to provide a open space to walk, free from obstacles that seniors could bump into. Keep the floors clear of newspapers, magazines, or books. This is a particularly dangerous place where accidents can occur. A home safety audit of this room is invaluable. Tubs should have skid proof mats and any rugs should have slip proof backs. Install guard rails (grab bars) to provide assistance when entering and exiting the tub or shower. An easier alternative that works well for most seniors is a tub chair. If your senior family member experiences challenges with mobility, they would benefit from a raised toilet seat. Encourage seniors not to bathe without someone else in the home. Keep a night light in bathroom and in the hallways leading to the bathroom. For better energy-efficiency you can invest in one that turns on automatically in the dark. Remove all clutter or impediments from the floor. Keep knives in drawers or in a rack. Heavy pots and pans should be kept in a cupboard, or any area that is only waist-high, to prevent accidents. Periodically clean out the cupboards and refrigerator of outdated foods. It is encouraged that the elderly try not to wear wide, long sleeves when cooking. Clearly mark all your medications and store them in a place where they are easily accessible when needed. Once a week put them into a convenient day-by-day case. Leave a printed copy of phone numbers to your emergency contacts near every phone. Your emergency contact list should be clearly legible, and should include family members who live or work nearby, your family doctor, and any other people you could rely on in case of an emergency. Of course, you should dial 911 in the event that you are severely hurt, in danger, or require urgent medical attention. Consider investing in a medical alert bracelet or necklace. 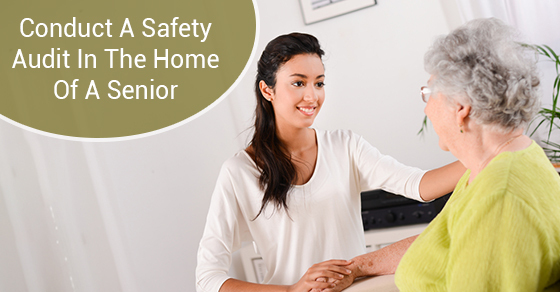 Help make home a safe place for your aging parents. Conducting an annual home safety audit will help you sleep better at night.